Welcome to Orbit Nepal Adventure (P) Ltd. If you are looking for a relaxing holiday and exciting destination to revitalize your mind, Orbit Nepal Adventure has a wide range of selections for you. Orbit Nepal Adventure is Known for its impeccable quality service which organizes tours, Trekking, expedition and other popular adventure activities throughout Nepal and neighboring countries; India, Tibet and Bhutan. A passionate team of dedicated individuals ensure your comfort while keeping the thrill of adventure a primary focus. With our dynamic team members and the quality service you would encounter the best ever travelling experience of life. We are a leading adventure and tour operator since 2008 and we value our customers. We believe in fact that “Customer’s satisfaction is our ultimate goal”. Making your need as our first priority Orbit Nepal Adventure has been hiring Professional, well trained and Certified tour guides and to serve you with the best possible local experience. Now you can experience the true culture and historical traditions making your adventure more insightful and informative. Orbit Nepal Adventure (P) Ltd is proud to have the best trekking and climbing guide in Nepal’s adventure tourism industry. Our staff is locally appointed on the basis of their guiding experience, knowledge, first aid certifications they acquired. Most of them have a strong sense of ownership. This is why we are able to provide quality service and best value trips all over Nepal. Mr. Bikram Thapa, a personality with great knowledge and passionate about Adventure is the Senior Team member of the organization. He was born in Godavari, North Eastern edge of Nepal. 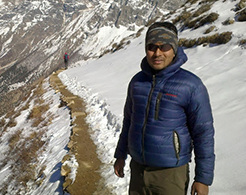 Before he started to operate Orbit Nepal as an associate he himself has worked as trekking guide with different organizations for several years. Thus having varied practical skills has inspired him to serve helping hands to nature and adventure lover and hence he is always available to enthuse the visitors. He won several hearts of travelers coming from all over the world due to his friendly and hospitable nature. He understands the needs of each member of the group during the trip and treats individually with great care. Apart from handling trekking and climbing trips, he also takes care of inquiries of the clients, reservation of hotel accommodations, transportation and flights’ reservations. Orbit Nepal Adventure offers you a wide range of experiences around some of the prime locations around South East Asia. Many Adventure enthusiasts visit Nepal seeking for adventure and to explore the natural wilderness and we are well prepared to facilitate and enhance the experience. Whether it is a Tea House or Camping Styles, our goal is to assist you in best possible way. We organize an inspirational expedition to Everest, Annapurna, Langtang and other popular areas such as Mustang, Dolpo, Kanchenjunga Including other less touristic destinations. We also operate and organize tour packages in Kathmandu, Patan, Bhaktapur and other popular world heritage sites in Kathmandu valley to enjoy the ethnic and cultural traditions. For further thrill in your adventure we are also willing to provide you the package tour to Pokhara, Lumbini, Chitwan and other beautiful villages to explore its beauty and wilderness. We provide sustainable tours and travel packages that provide insight into the cultural, historical and natural beauty of Nepal and the surrounding countries as well as supporting the communities in which they visit. Everest Trek: Conducted Everest all regions trekking since 2001 guided by Chairman of the organization. Since 2008 a competitive agency has been established which operates all sorts of trekking. Trekking and Expeditions: Orbit Nepal adventure operated several trekking, climbing, and expedition programs to more than 100 peaks & trails with full safety and delight. Adventure and Tour Activities: We also specialize in adventure and tour activities such as charity treks, fund raising treks, treks for school students, treks for awareness, treks for sanitation, cycling for peace, corporate adventure activities and many more. Success: So far we’ve achieved an amazing success rate of around 95%, which is an enormous record for any adventure operator based in Nepal. We are among the few pioneering tour operators in the Himalayan region of Nepal and always strive to organize a quality service to our client assuring you a superior holiday experience. “Each day is a new day”. We are working hard each day towards raising the bar of our service plans and improved high standard customer service. We are committed to enhance local capacities and skill which will help the economic revival and sustenance of the communities inhabiting around the trekking routes. We encourage Responsible tourism by supporting the local initiatives and sensitizing local tourism institutions to promote sustainable practices of tourism and its improvisation. Customize tour itineraries (Charge as per interest of the clients). Adventure sports such as White water Rafting, cycling tour, Bungee jump, Paragliding etc. Jungle safari tour for single and group .